The memorably quirky tunes sung by Jack Skellington and the citizens of Halloween Town are reinterpreted with animated string arrangements by Vitamin String Quartet. Songs like “This is Halloween,” “What’s This?” and “Kidnap the Sandy Claws” are spun into a whirlwind of violin, viola and cello. VSQ’s performance of the music of “The Nightmare Before Christmas” is, like the film itself, moody, beautiful and joyous all at once. Includes the bonus track “Jack and Sally Montage”, previously featured on Disney’s Nightmare Revisited album. Kings of Leon Cover Pixies' "Where Is My Mind?" Kings of Leon got this one right – from the distorted guitar lines and hauntingly high “ooohs” to the simple drums and vocals on edge. It’s no wonder the band covered this Pixies staple in several concerts throughout its 2010 tour. Whether you know it from the final scene of Fight Club, HBO’s promo for The Dark Knight (who’s seeing the final movie this weekend? ), or just listen to good music, there’s a reasonable chance you’ve had this song stuck in your head in the past 21 days – or you will now. Musicians from Arcade Fire to James Blunt have covered it as well – and some even covered it without calling it a cover (here’s looking at you, End of Fashion’s “O Yeah”). Either way, the 1988 tune inspired by scuba diving in the Caribbean (and “having this very small fish trying to chase me” - Black Francis) has come a long way. Matisyahu Covers Kings of Leon's "Use Somebody"
And so the coverer becomes the covered – but compared to the Kings of Leon cover of “Where Is My Mind?,” this Matisyahu treatment of “Use Somebody” isn’t interesting for its similarity to the song, but rather its difference. The acoustic guitar and delicate, high vocals not only diverge from the original song, but also from Matisyahu’s usual style of heavier reggae-rap rhythms. Though the lyrics are the same, the Hasidic reggae singer changes the flow of them to suite his own style, topping off the song with his characteristically uncanny beatboxing skills. Yes, you read that right: KoRn covered a song in a children’s movie. But this isn’t Disney, This is Halloween – from the specter director Tim Burton himself. Had it been any other animated film, this cover might seem out of place; but given the inherent twisted fun in most of Burton’s delightful nightmares, KoRn’s heavy metal insanity lends itself well to this tune recorded for Nightmare Revisited . More intense than the original sung by the sadistic Halloween Town kids, this cover is entertaining to listen to. From the heavy metal shouts of “Kidnap the Sandy Claws, lock him up real tight/Throw away the key and then/Turn off all the lights “ to the harsh whispers of “Kidnap the Sandy Claws, beat him with a stick/Lock him up for ninety years, see what makes him tick.” Sweet dreams, everyone. And psst . 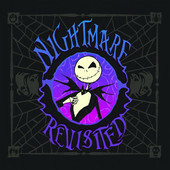 . . Nightmare Revisited also features a cover of 'Jack and Sally Montage" by VSQ! Check it out here!